I love the four stories in The Red Pony. I had never heard of the book until my girlfriend took it out of the library fairly randomly one day when she was visiting Cincinnati. She didn’t have time to read it but left it at my apartment. I picked it up and was blown away by each story’s quality. So it seems kind of silly, even cheap, to highlight something so simple as sentence structure. The stories are rich with all kinds of magic tricks. But then again maybe sentence structure is the most important magic trick to highlight. 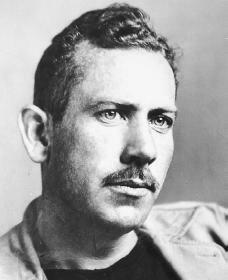 Basically, Steinbeck writes exactly like I do not. I tend to ramble with lots of loose, conversational language that probably just gets in the way more than anything. Steinbeck’s sentences are sleek and direct. He uses almost no commas to offset phrases. Stories don’t read themselves, but this one sure comes close. And that’s quite a trick on Steinbeck’s part. Jody felt mean then, so he threw a rock at Mutt. Then he took his slingshot from the porch and walked up toward the brush line to try to kill a bird. It was a good slingshot, with store-bought rubbers, but while Jody had often shot at birds, he had never hit one. He walked up through the vegetable patch, kicking his bare toes into the dust. And on the way he found the perfect slingshot stone, round and slightly flattened and heavy enough to carry through the air. He fitted it into the leather pouch of this weapon and proceeded to the brush line.